Request A Hassle Free Quote. Typically friends and co-workers buy gift certificates from us to help out a friend or boss after they have suffered an injury or have gone through physical trauma or surgery. We receive calls from as far as New Jersey and Chicago from friends and family wanting to help out regardless of distance. We print out a custom certificate, mail it or hand deliver our selves making the gesture that much more memorable. We Serve 20 Mile Radius of Litchfield, Avondale, Glendale, Surprise, Peoria, Tolleson, Sun City, Scottsdale areas. We make sure that those who receive your gift are truly impressed and happy that you did this for them. 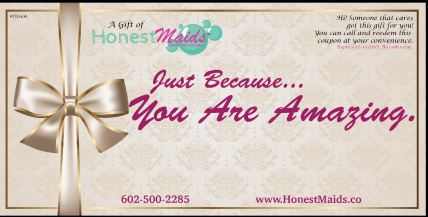 Is very common for women to give out a gift certificate to an injured friend or someone who currently out of town or going medical treatment. We print out a beautiful stock gift certificate and personally fill it out and deliver it to them. Your gift can be redeemed at any moment of their choosing. It does not expire. I have hired this company multiple times already! They are simply amazing and just the friendliest. Like I've said on Yelp, I would recommend them. One Of The Best In Phoenix! I am very pleased with the service that they provided and was really happy with the modest fee that I paid! My house didn't smell like a chemical plant when they were done and they take great pride in their work. I am using them once a month to keep my house looking pristine all the time. I hired them for a move out and move in – they did a great job on both, What impressed me was that Diana was just so friendly and energetic. You can tell she cares about the impact they have and pay attention to details. Copyright © 2018 Honest Maids LLC. All Rights Reserved.